I live in a very small space, so I've been trying to come up with low-maintenance, inexpensive, space-saving plant containers. 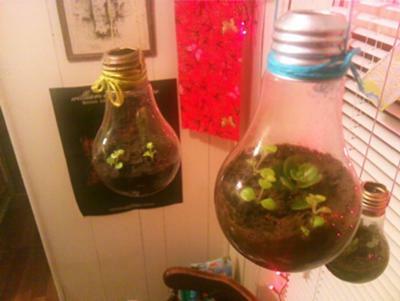 Succulents are obviously the best plant choice, and used light bulbs have turned out to be perfect for them. I keep these all over the place now, and they seem happy without much care. Plus, the narrow neck protects them from cat hair - a problem all of my other plants have to deal with. Hah, they've grown a little since I put them there. It's really easy when they're tiny. 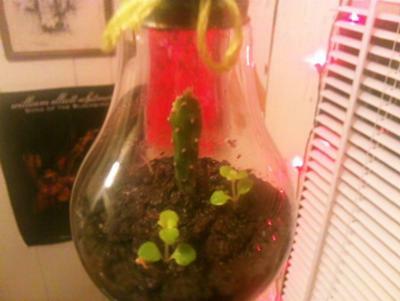 I use pliers to break the bottom and pull out the glass inside, then I wash and dry it, and add a little soil and a baby succulent. I'll have to try that - thanks! 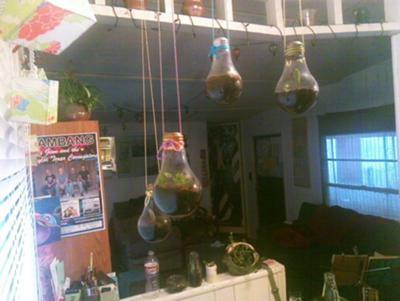 What I want to know is; how on earth did you get the plants in there?